Brisbane’s proximity to the gorgeous destinations of New Caledonia and Vanuatu make 7 night cruises to the South Pacific islands, which operate year round, the most popular cruises from Brisbane. If just one week isn’t enough, who not take a longer island escape up to 2 weeks. Do not however overlook a cruise along our own beautiful coastline, visiting iconic cities, idyllic islands and of course the Great Barrier Reef with one of many local Australian cruises. If you’ve frequented local shores and Pacific Islands and want to try something different, Brisbane is also the primary departure port for cruises to Papua New Guinea. Scroll down to view the full list of cruises from Brisbane. 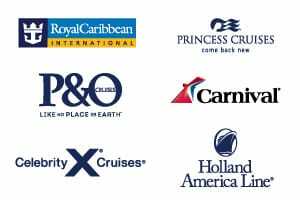 At Cruise Guru we offer over 200 cruises from Brisbane, the second largest cruise embarkation port in Australia, across five ships including the Carnival Spirit, commencing cruises from Brisbane in late 2020. Too long to wait? View all last minute cruises from Brisbane. For those wanting a quick escape or if you’re just interested in giving cruising a try, there are numerous 3-4 night getaways, which either spend their time purely at sea or visit one other Australian port. We also offer a range of cruises that depart from another port and arrive back into Brisbane, including short hops from other Australian cities, re-positioning cruises departing from Asia or longer trans-pacific cruises from west coast USA. View one way cruises into Brisbane. Alternatively you may wish to view cruises from Sydney, cruises from Melbourne, cruises from Adelaide, or cruises from Perth. Our cruise specialists are on hand to help you with all your cruises from Brisbane enquiries. Contact us or request a call back to chat with one of our friendly consultants.